RiÄ¨ardas Berankis playing in the Australian Open. The Lithuanian tennis player RiÄ¨ardas Berankis has made a brilliant start in the 2011 Australian Open. 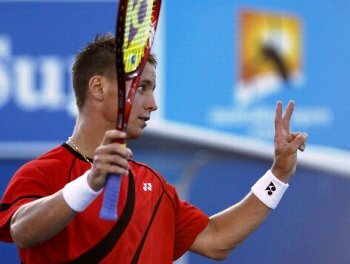 In his first match last Tuesday, January 18, he easily defeated the Australian Marinko Matosevic 6:4, 6:2, 7:5. In his next match on Thursday, January 20, he completely demolished the Argentinian David Nalbandian (ranked 21 in the world) 6:1, 6:0, 2:0. The fact that Nalbandian was exhausted after his defeat of Australian Lleyton Hewitt two days earlier in a marathon 5 hour, 5 set match, may have contributed to Berankisā€™ easy victory. But Berankisā€™ victory was still remarkable. RiÄ¨ardas Berankisā€™ run at the Australian Open was ended in the third round as he was swept aside by seventh seeded Spaniard David Ferrer in straight sets, 2-6 2-6 1-6.